With diversified distribution channels nowadays, it becomes more difficult to gain visibility across all channels that sell your products, especially emerging channels (e.g. parallel import retailers or online retailers) or general trade. You may have a higher degree of confidence in sales data for some channels, but there may be uncertainty or simply no data at all for others. This may yield a skewed model of the market, where 100% of ‘measured volume’ does not actually equal total market volume – in turn leading to misallocation of sales and marketing spend or misjudgement in strategic planning. 1) We start with a quantitative interview, either point in time or diary based with a sufficiently large, representative sample of buyers of the target products/ categories. 2) This allows us to understand category purchase behaviour and identify all channels that contribute to category sales. 3) We collect category purchase behavior data by channel (e.g. frequency, volume) to calculate volume purchased for each product or category in each channel, building a market volumetric model. 4) Using internal sales data or other sales data sources for channels where we have a high degree of confidence in its accuracy (such as chain supermarket) we calibrate our model. 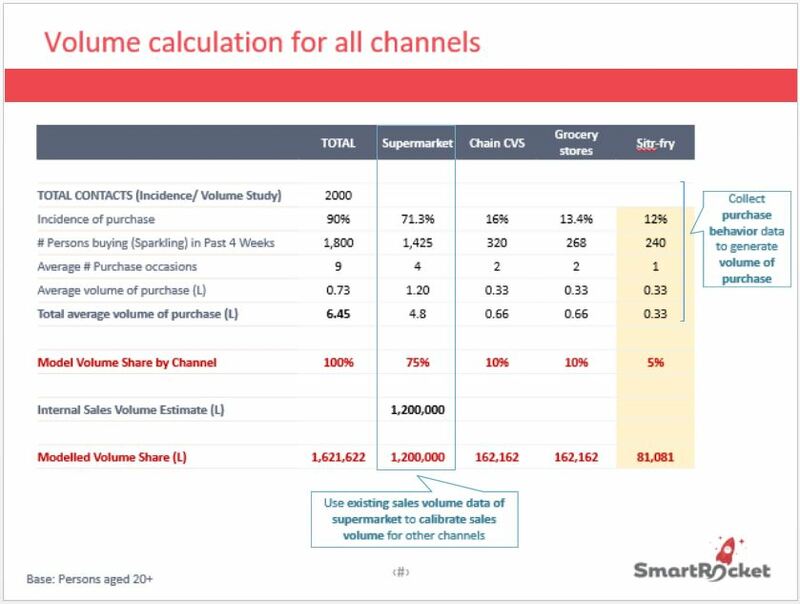 5) Based on the above logic, we can calculate volume contribution for all channels in the market model. Where are the missing sales? Eating out is one of the primary occasions for the beverage category. Additionally, grocery stores are also common in many markets. Yet these are often not included or well covered in existing sales data. 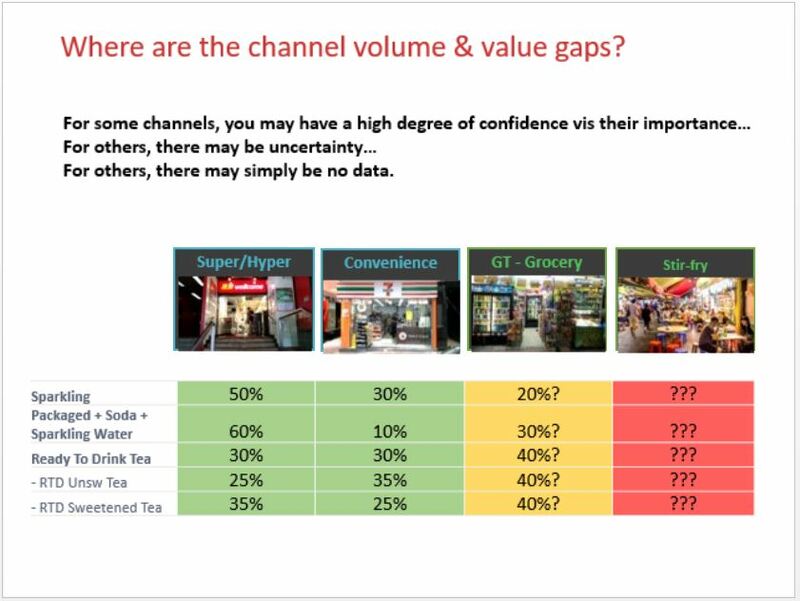 Such information about missing channels can be covered in the shopper purchase volume study by ROS. Impact on business – in the drive to improve sales growth, understanding the size and importance of low (or no) visibility channels remains a key concern in the strategic planning process. 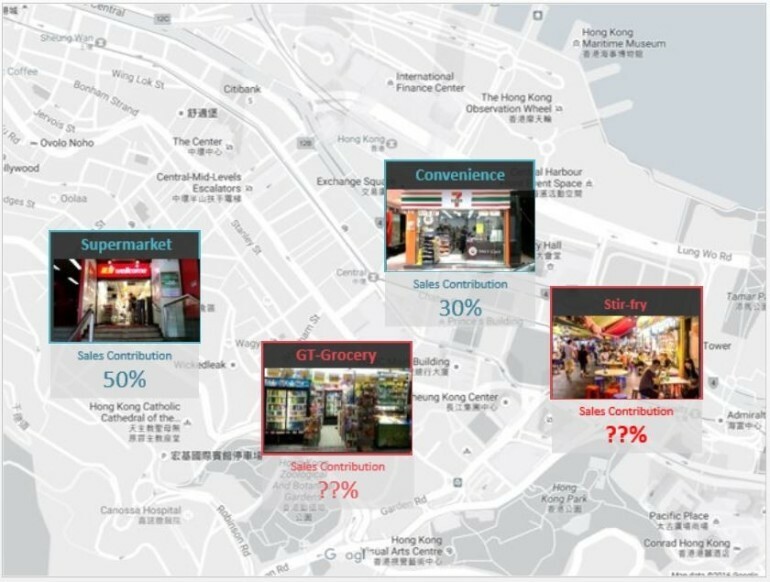 Via Red Ocean Shopper Insight, it’s possible to gain better visibility across all relevant channels for your categories, brands and products. In turn, get clearer direction for formulating channel strategies that improve overall sales performance.